I’m a bit late in posting this, playing catch up with posts. 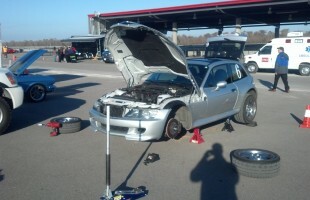 On 15 and 16 February I attended a Chin Motorsports track day at NOLA Motorsports Park in Avondale, LA, just a few miles south of New Orleans. This was Chin’s first foray into tracks west (just barely in this case) of the Mississippi, and was the perfect opportunity to check out this practically new track. I had joined Chin (just a $50 annual fee) as soon as I heard they were coming out west, with planned track dates at TWS, MSR, NOLA, Hallet, and others in the area. I did this in anticipation of a future move back east, and figured I better become a known quantity with their organization so I could run places like Barber, VIR, and Road Atlanta. The track, on the other hand, is a beautiful facility. It opened in 2011, so it still has that new feel, and they are still in the process of nearly doubling the size of the road course. Currently there is a 2.75 mile road course, a large kart track, and a big skid pad for autocross or drifting. Being lower Louisiana, the terrain is very flat, so no elevation changes. Fortunately the track designer did a very good job of incorporating nearly all the other features you’d want in a race track. Nearly all the turns have generous run-off areas, except for the front straight that parallels a wall. Of course you’d have to be doing something very wrong to end up hitting that. All the corner worker stations are elevated platforms, which make it extremely easy to see far in advance of any trouble that may lay ahead. There’s also a nice gift shop, with a diner located above it. Unfortunately the diner wasn’t quite up to speed with the rest of the facility, I recommend you bring your own snacks or head out to the town for food. 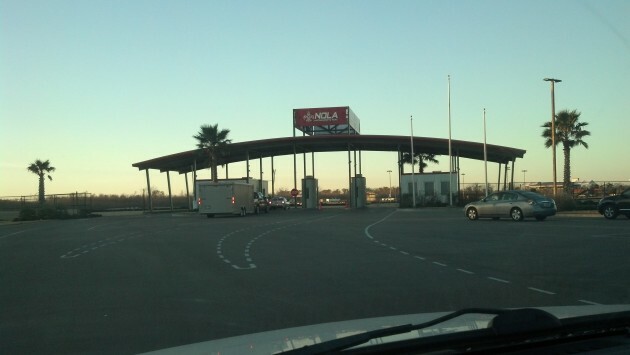 Closer to the entrance of the park are enclosed garages for members, and there is even a convention center separating the road track from the autocross lot. The cold pits were covered, but that is the extent of covered space for visiting drivers. The image below shows the eventual layout of the entire park, with a future south course joining the existing northern section to form a 5.37 mile full course! 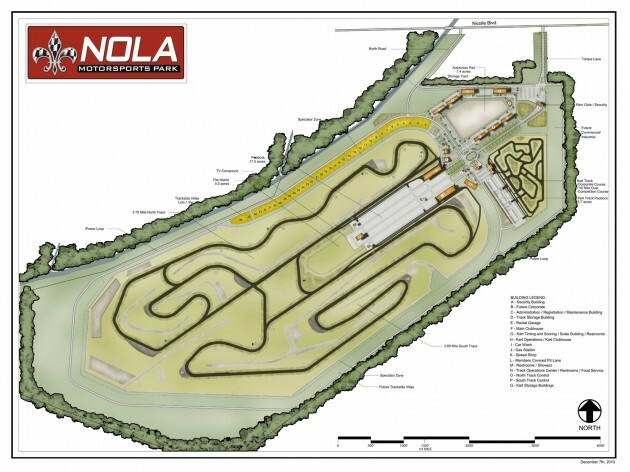 Since I had never run NOLA or with Chin Motorsports, I was placed in with the novices, but given a solo pass. I was fine with that, considering I would be learning the course by trial and error. I didn’t get an instructor the whole weekend, though I did request one. I think Chin might have been short on instructors, and there were a few they had that I was a bit concerned with. I say that because even with instructors in the novice cars, I saw some pretty odd behaviors, like coming to a full stop at corner stations under a full-track black flag. Other oddities: no flags displayed with rescue vehicles on track. I came up on tow trucks several times at full speed, with workers out on foot, and no flag in sight. Some of this may be just growing pains, but it didn’t instill a lot of confidence in the marshals. There were also a few other concerns, like a car that continued to pour out smoke so thick you couldn’t see the course, yet was allowed to continue to run. Fortunately they got that car sorted for the second day, but most other organizers would have pulled it. Despite a few hiccups, I still enjoyed the track immensely. The layout provides for plenty of passing opportunities, and the corners flow very well from one to another. Turns 8 through 12 are particularly fun, becoming a high speed rhythm section. I found I could enter without braking, but it required precise turn-in points or the M Coupe would plow (check my video to see how that turned out!) I was able to learn the course pretty quickly, especially considering I was alone and unafraid, hell I was the first car out on Saturday and had no one to even follow. By Sunday afternoon I was working on bringing my times down, eventually taking a second per lap off to the point I reached a 2.01 by the closing checkered. The car held up fairly well, though I was really eating through the tread on my RE-11′s, which were damn near slicks. I was also getting quite a bit of brake judder, which upon further inspection I discovered was caused by my front rotors cracking. 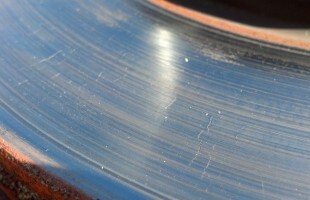 They were micro fractures, not quite all the way through the rotors, but enough to bother me. I made some calls around and found a set of blanks up the road at Autozone. I wouldn’t normally advocate using Chinese parts store rotors, but given the choice, they would do. I quickly swapped them out in the paddock, did some high speed bedding in the large open paddock pavement and let them sit Saturday night. Sunday morning all was well, no more pulsing from the brakes. The PFC 08 pads really are a huge improvement over the PFC Z (street performance) I was previously using, as long as you can stand the squealing. As always, I captured video of the event with my GoPro cameras. Unfortunately both micro-SD cards became corrupted when I tried to review the video on my Android tablet. Lesson learned to not do that, or at least have extra cards on hand. So I didn’t record any video from Sunday, when I was putting down my best times. Below is the video from Saturday’s fourth session. Note the unholy understeer I mentioned previously leading into the fast esses. And if you are wondering what I was staring at over my left shoulder during the first green lap, it was the huge cloud of oil smoke the red Focus left, which you can see pitting shortly thereafter. Apparently it was sucking oil directly into the intake, making for some spectacular smoke screens.